jason with the dragon shield. 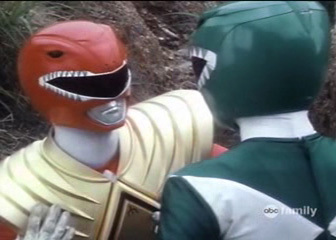 Jason does not look like a weenie wearing the Dragon Shield, and neither does Tommy. The only person who looks sucky while he's wearing the Dragon Shield is Zack! Thank the heavens that only happened for one episode! Yeah, but at least Zack looks sucky wearing a durable high-quality foam Shield unlike the other two who had to swap between said shield and a cheapy you can get from the Fighter Flea market for three cents at most. It wasn't the last time they put a ranger in black and gold, though. JASON: "Tommy, how do you get your breath minty-fresh?" TOMMY: "Gum." Jason: "Tommy, do you mind if Kim goes out with me?" Tommy:' Yes. Dude she's mine, get over it."